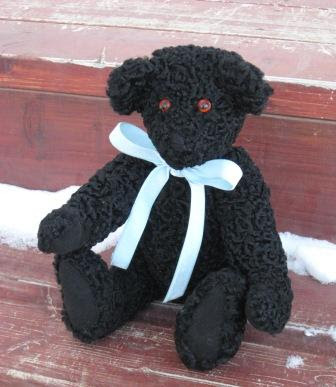 This is Edgar the little black Bear. He is this years very special gift. 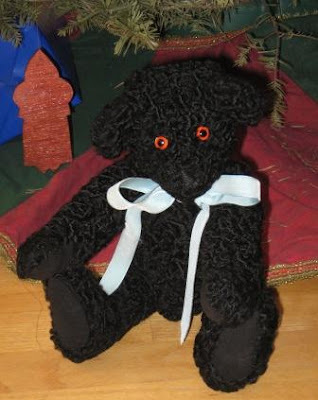 I made Edgar for my mom Betty. He is made with Grandmother`s old Persian lamb coat. I had this idea many months ago. I collected the supplies this fall and got him started at a quilt retreat in Oct. I am pleased with his face and the sewing I did on him. I wish I had gotten the joints all tighter. Note to self do the joints up more and then a little more. I have enough coat left to make myself a bear. 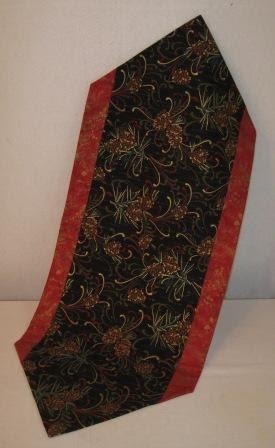 This is a table runner I also made at the quilt retreat. I gave it away in a swap on Two Peas. 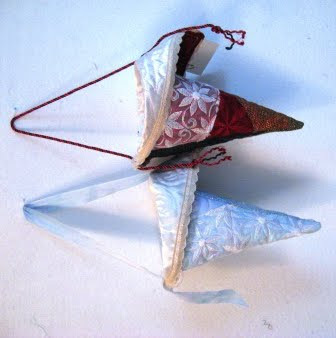 I also made two more in different Christmas colours. I kept one runner for myself and gave another one away but forgot to take a photo of it. Some of the ladies in the Leduc Quilt Guild have been making these. I thought I would give the pattern a try. They call it the 20 min table runner. The first runner took me 25 minutes and now it does take 20 mins. Not like the `Quilt in a day` that takes a year to do. 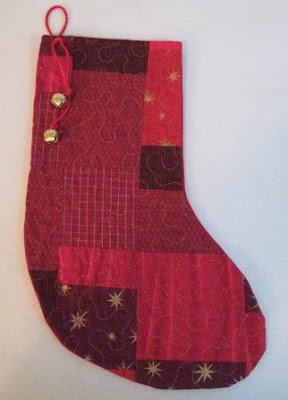 A red Christmas sock also given away in a swap on Two Peas. I made 12`squares of quilted fabric and then trimmed and made cones. I got the idea in an older Quilting Arts Magazine. I took many other photos of how I made them if anyone out there want to know more. Edgar under the Tree. Hope you all had a great Christmas.